Montreal St. Patrick's Day events are much like St. Patrick's Day activities of years past. Breakfast events, Irish pub fun, live music, and of course, the parade, St. Patrick's Day itself might be on March 17 but the festivities spreads out across several days. Founded in 1834, the St. Patrick's Society of Montreal aims to bring together and support Canada's Irish community. Its annual St. Patrick's Day Luncheon is one of its many social traditions, an event crowned by a guest speaker. Although the 2019 guest speaker hasn't been announced yet, last year Jean Charest PC, former Premier of Québec and Deputy Prime Minister of Canada in 1993, was the honorable guest. Similar to the rest of Montreal's top Irish pubs, you won't find personal space here, especially during St. Patrick's Day festivities. But if you can handle it, you may get to witness people breaking out into Irish steps. It's been this way for at least 20 years. The decor, live fiddling, and rambunctious happy crowd might trick you into thinking you've landed in Dublin. In previous years, Hurley's has hosted a buffet breakfast on St. Patrick's Day and on the day of the parade. Items included sausages, soda bread, mashed potatoes, and other native delights are on the menu. The cost in past years was $20 a person and included an Irish coffee. All hail Mad Hatter Pub's traditional St. Patrick's Day lamb Guinness stew, an annual tradition on the days leading up to St. Patrick's Day and lasting through the day of the parade. It's typically just $5 per portion. Another promotion often found at Mad Hatter Pub is $1 for the first 50 shots of Jameson of the day. Mad Hatter Pub has also held a breakfast on parade day beginning at 9 a.m. in previous years. All six of Ye Olde Orchard's location typically have live music on St. Patrick's Day proper, beginning at 5 or 6 p.m.
As for parade day, the brekkie locale of choice is typically Ye Olde's downtown pub on de la Montagne Street, just south of Ste. Catherine Street where the St. Patrick's Day parade takes hold as of noon. Served as of 9 a.m., the menu is your standard à la carte, though if a full day of drinking awaits, we recommend the Hearty Highlander, a three eggs with three meats (bacon, ham, sausage) brekkie complete with potatoes, tomatoes, and Irish toast. The downtown Ye Olde location typically features live music after the parade. The Plateau location may be your best bet for a nearby post-parade location to score a seat, given that it's a good 15-minute walk away from parade territory. McKibbin's is easily downtown Montreal's roomiest Irish pub with its three floors. Mind you, its other three locations, including on the Main, are comparably sizable. For the purposes of St. Patrick's Day proper, McKibbins' downtown spot on Bishop and its Point-Claire location typically hold a brekkie from 6 to 10:30 a.m. on St. Patrick's Day complete with live music and Celtic Grace Dancers. Breakfast has been $15 in previous years and has included an Irish coffee. If you have your heart set on catching Montreal's St. Patrick's Day Parade, consider the convenience (and early morning parking options in the heart of parade central) of McKibbin's downtown location on parade day. Breakfast is typically served as of 8 a.m. and live music runs through 1 p.m., giving patrons plenty of time to enjoy some grub, a couple of morning pints, and freshen up in time for the first floats at noon. Arrive there early if you want a seat. Otherwise, head to the boulevard St. Laurent pub for your Irish breakfast fix and walk 15 minutes to the parade when you're finished. 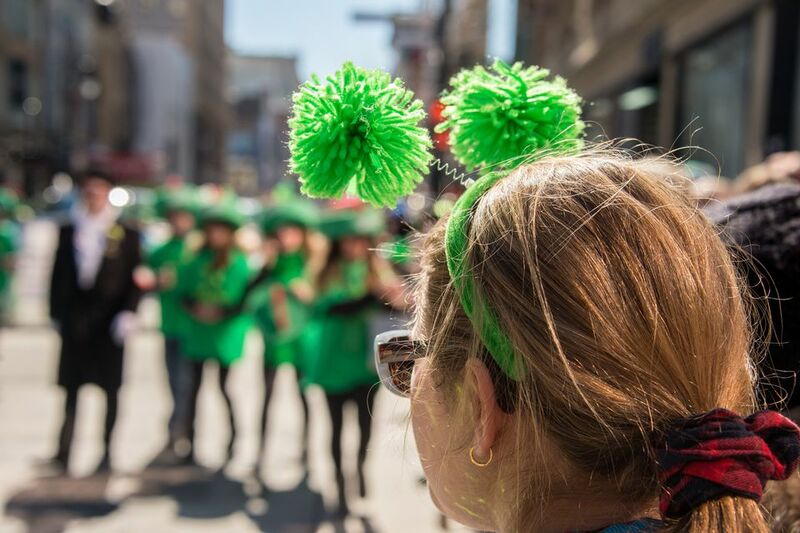 The Montreal's St. Patrick's Day Parade isn't just Montreal's most popular St. Patrick's Day event, it's actually one of Montreal's most popular events of the year. Beginning Sunday, March 17, 2019 at noon, here's the scoop on where and when to catch it.